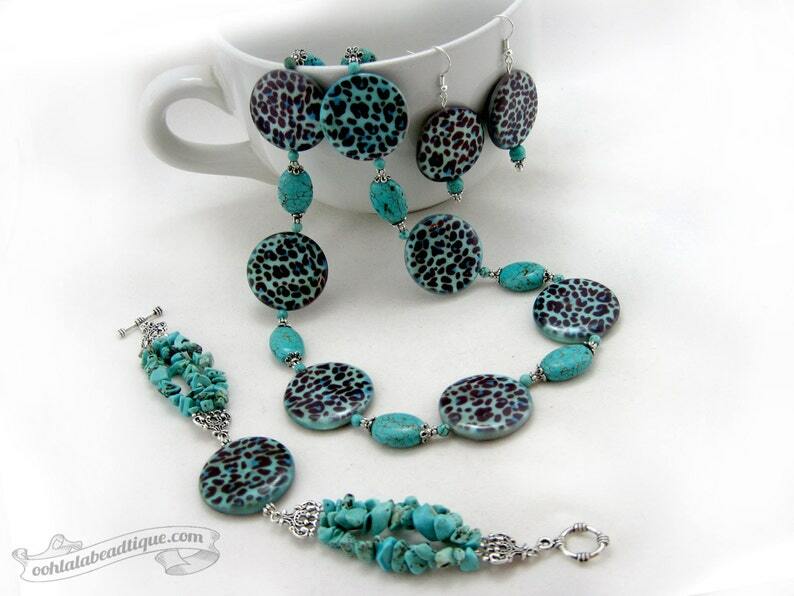 Give yourself a glorious makeover with this gorgeous Turquoise mother of pearl jewelry set. Turquoise coin shaped Mother of Pearl beads with leopard print, oval and chip Turquoise Howlite beads, and Tibet silver are combined together for a stylish look. The necklace, and the bracelet are strung onto tigers tail wire for strength, durability and drape. The necklace is finished off with a large lobster clasp and a bead dangle chain extension allowing for varied length adjustment. The bracelet is finished off with an ornamental toggle clasp. The earrings are strung onto silver plated wire. The necklace is 20 inches long including the clasp. Necklace chain extension is 2 inches long. The bracelet is 8.5 inches long including the clasp. The earrings are 2.5 inches long including the hooks. According to the oriental traditions, the Mother of Pearl is a very symbolic stone. This symbolism is based on the belief that Mother of Pearl attracts wealth and a better income to the person who keeps it. Besides attracting wealth, the mother of pearl also symbolizes prosperity and good luck. It is often given as a present in order to wish good luck to a friend or a loved one in any type of situation. Carrying a symbolic item containing mother of pearl, a person's good luck and prosperity would become highly improved and enhanced. Many cultures, ancient like Egyptians, or even contemporary like that of Tibet, prize Turquoise as a Life Stone, and the mineral is carried throughout one's entire life. In the past it was exchanged as currency, and the finest turquoise stones were pondered more valuable than gold. Turquoise is considered to be a symbol of generosity, sincerity, and affection. It preserves friendships, and can make friends out of enemies in time. Traditionally is is said to only bring good luck if given, not purchased. 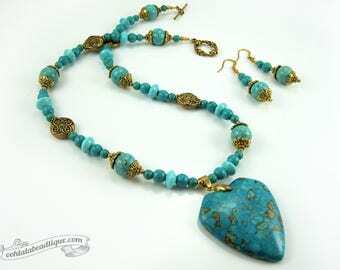 If you are purchasing the Turquoise mother of pearl jewelry set as a gift for a special occasion and you would like to add that special touch, I'm happy to offer a gift wrap option that can be purchased together with the item. 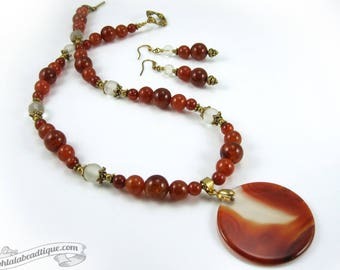 Please visit the following URL link to add a gift wrap, a gift note or both: https://www.etsy.com/shop/OohlalaBeadtique?section_id=14640949. Many Ooh-la-la Beadtique handmade products are crafted using natural components such as semiprecious stones, freshwater pearls, and wood. No two materials in nature are alike. 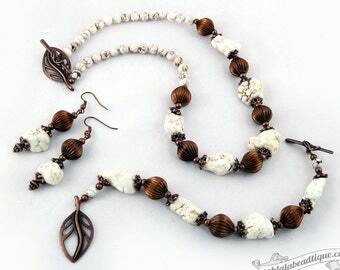 The handmade Turquoise mother of pearl jewelry set that you will receive may slightly vary in shade and texture pattern from the picture listing. Also note, that all monitors and computer screens are calibrated differently. The same product may appear in diverse colors on different monitors. Please disregard my previous post. Review of wrong item. Sorry. I bought this item a few weeks ago, and wanted to wait to leave a review. After wearing this product for some time, challenging it in different situations. This product's craftsmanship and appearance is stunning, and flawless. I highly recommend this product. Ooh-la-la Beadtique accepts Visa, Mastercard, Amex, debit card, and Paypal. I do not accept checks or money order. The customer is responsible for paying any applicable local taxes and/or import duties. I completely understand that shopping online is a little more difficult because you cannot see the piece in real life. Photographs are enlarged to show detail, and actual sizes are represented to the best of my ability through additional photos and measurements in imperial units (inches/feet), which can be converted to any desirable measurements using an online unit convertor - http://www.digitaldutch.com/unitconverter/. If you are not completely satisfied with your purchase, I will be happy to issue you a refund (minus shipping) for any item that you are not happy with. Please contact me BEFORE returning an item within 3 days of receipt for a refund for a Return Authorization (RA) Number. Once you receive a (RA), you MUST return the item in its original unused condition (including attached tags) with the Return Authorization clearly marked on the package and a copy of the invoice. If there is an error on my end, I will accept responsibility for return shipping. Otherwise, return shipping is the customer's responsibility - I recommend using the original packing materials, and shipping with tracking, to ensure the item is successfully delivered and returned in the condition received. For hygienic reasons, all earrings are FINAL SALE, sale and clearance items are also final sale. All proofs of shipment (stamped by the post office) are kept for one year, please note that there will be NO refunds for uninsured items sent through Light Packet service - a copy of the proof of shipment can be e-mailed upon request. Ooh-la-la Beadtique currently sells and ships jewelry ONLY to North America (Canada and US), Australia, New Zealand, and selected European countries. No shipments can be made to APO, and FPO addresses. All orders are mailed through Canada Post. Domestic orders will be processed 1- 3 days after payment, International orders 3-5 days after the payment, Monday to Friday. I will not process or ship any orders on national holidays. My business hours are 9am-5pm EST. I combine shipping for multiple orders. The standard shipping method (Lettermail Canada and Light Packet USA/International) used is the most economical - it does NOT have insurance or tracking. I cannot be responsible for purchases once shipped unless insurance is paid for. Add the Upgrade Shipping to your shopping cart, if you would like insurance, tracking or rush delivery (Xpresspost or Priority Canada, and Expedited or Xpresspost USA). The shipping upgrades are available from a drop down menu during shopping cart check out or at following URL link: https://www.etsy.com/shop/OohlalaBeadtique?section_id=14640949 Rush deliveries are available to Canada and USA ONLY. Currently I don't offer rush deliveries outside of North America. For further inquiries you can contact me through Etsy by going to my shop URL https://www.etsy.com/ca/shop/OohlalaBeadtique and clicking the "Contact" link located on the right under Shop Owner icon. Please note that import duties & taxes from customs, are not included in item prices or shipping costs and are the buyer's responsibility. Your handmade purchase will be packaged in an organza dust bag. It will then be shipped to you in a padded mailing envelope. Please note that it is a condition of sale that commercial resale of my products is not permitted without prior negotiation with me. Please contact me if you wish to discuss reselling. All of my work, including but not limited to text and images on this website along with completed jewelry and other objects, is protected by Canadian and International copyright law and is not licensed without our permission, including upon purchase of my products. If you have any further questions, please feel free to contact me through Etsy by going to my shop URL https://www.etsy.com/ca/shop/OohlalaBeadtique and clicking the "Contact" link located on the right under Shop Owner icon. 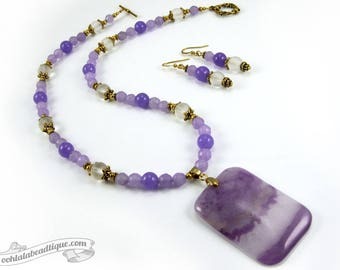 I'll be more than happy to accommodate requests for custom orders, shape, size, color of beads, or type of stones. Message me regarding a special order for price variation. Once a design is agreed upon, custom orders take on average from 1 to 6 weeks depending on the quantity of the order, and availability of components. I can give you a better time estimate once you contact me to initiate your order. Customized Christmas Gift orders must be placed by October 31st. I do not take custom orders during month of November and December. 1. Jewelry should only be put on after washing and applying any makeup, hair spray, gels, lotions or perfume. 2. Protect any jewelry from harsh chemicals, extreme temperatures and sunlight. 3. You should not wear beaded jewelry while doing household, outdoor chores or sports. 4. You should never wear any jewelry when swimming or showering. The chlorine can cause damage to various gemstones and metals. 5. Store your jewelry separately so it doesn't scratch other jewelry. Plastic bags or cloth dust bags are wonderful for protecting jewelry pieces. 6. Always store your beaded necklaces or bracelets flat. 7. Keep your jewelry in a clean, and dry place. Do you repair any old jewelry and rosaries? Unfortunately I don’t repair old beaded jewelry or rosaries that was not purchased from Ooh-la-la Beadtique. Many handmade jewelry pieces are often constructed from one-of-a-kind components, leaving them impossible to find again. However I do offer a Redesign Service. If customers have broken or unattractive beaded jewelry in their jewelry boxes and want it redesigned I will be happy to do so charging for my time and materials. This service results in new piece of jewelry or rosary at a fraction of cost of a new retail piece. Feel free to contact me for more details. If your item has minor damage due to wear, or an accident within three years from purchase, please contact me, and more often than not I will be able to provide you with repairs with no labour costs. You will only need to pay for postage and possible materials costs. Note that items which have major damage, particularly to the 'focus' of the piece (eg. a pendant being badly scratched or dented), may not be able to be repaired and you would instead need to consider replacing the item. Contact me with your issues, and I’ll be more than happy to give you an idea of what will be needed to repair your item. Do you have a physical store location where a local pick up can be made? Although Ooh-la-la Beadtique jewelry studio is located in Toronto, Ontario, Canada, my products are sold from my online store ONLY. Please note that in order to maintain the volume of work and the lowest pricing possible, Ooh-la-la Beadtique is Mail Order only. There are absolutely no local pickups. I will be more than happy to take care of gift-wrapping for you. Why does my order look different than your product listing? 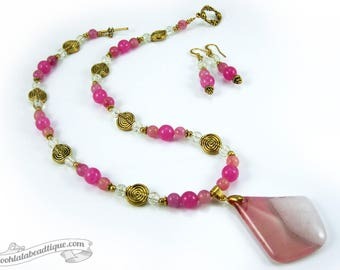 Many Ooh-la-la Beadtique handmade products are crafted using natural components such as semiprecious stones, freshwater pearls, sea shells and wood. No two materials in nature are alike. The handmade product that you will receive may vary in shade and texture pattern from the picture listing. Also note that all monitors and computer screens are calibrated differently. The same product may appear in diverse colors and contrast on different monitors. If you have any questions, the best way to contact me is through Etsy by going to my shop URL https://www.etsy.com/shop/OohlalaBeadtique and clicking the "Contact" link located on the right under Shop Owner icon. Please note my business hours are Monday to Friday 9-5 pm EST (my time zone). If you message me after my business hours you might have to wait till next business day to receive a reply. I try to respond to my emails within 24 hours, except for weekends or statutory Canadian holidays. In order to maintain the volume of work and the lowest pricing possible, I offer only email based customer support. Currently I do not offer telephone support.